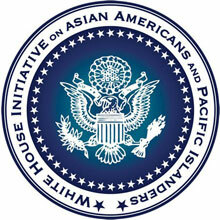 Seal of the White House Initiative on Asian Americans and Pacific Islanders (WHIAAPI). Emory will host the first ever meeting in the Southeast of the White House Initiative for Asian Americans and Pacific Islanders (WHIAAPI) on March 16 from 9 a.m. to 3:30 p.m. in Cox Hall. The Southeast Regional Action Summit of WHIAAPI will convene to create an action plan for empowering the Asian American and Pacific Islander community. Christopher P. Lu, cabinet secretary and assistant to President Barack Obama, who co-chairs WHIAAPI, will give the keynote address. Four breakout sessions will focus on the issues of immigration and civil rights; health care and mental health issues; housing and foreclosures; and small business and economic issues for entrepreneurs. A Town Hall Meeting/Listening Session will be videotaped and livestreamed. • Create ways to communicate issues of concern to the AAPI community to the Obama administration. • Learn about available federal resources and programs and develop solutions to address these issues. • Develop opportunities for networking and sharing problem-solving approaches. The summit is free and open to the public until full. Registration is required to attend. Emory's Office of Multicultural Programs & Services will be participating.